Pali Aike is a fine and remote National Park in southern continental Chile, located close to the Strait of Magellan and the Atlantic. The name Pali Aike is from the original tribe Tehuelche and means Devil's Country. It is a harsh volcanic steppe decorated with extinct craters, caves and other volcanic formations. 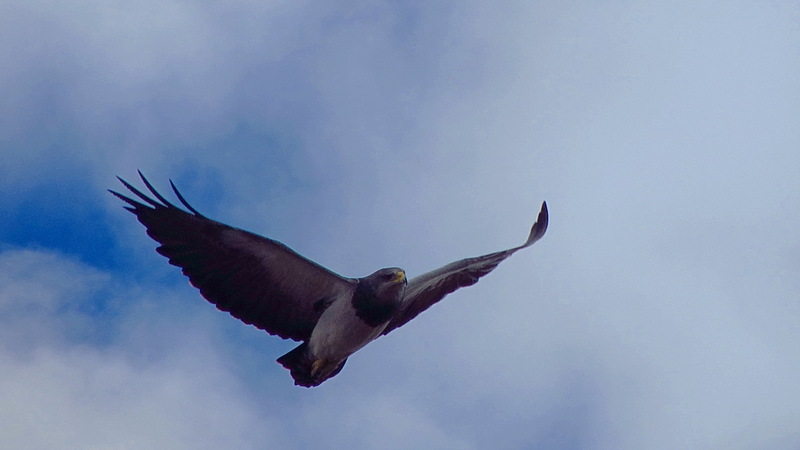 Wildlife is abundant, for instance you might see Guanacos, Eagles, Armadillos or Grey Foxes. The entrance to the Pali Aike National Park is free of charge as well as a nice campground. There are several superb hikes. We came back to the Torres del Paine National Park on December 22nd 2011, because Tommy, Marion's brother wanted to hike the W. This is the most popular part of the Circuito Grande, which we did few weeks ago. There are some "side" hikes at the Guarderia Lago Grey like the viewpoints Mirador Zapata and Mirador Ferrier. After visiting the cave, we spent the shortest night in the Pali Aike National Park totally alone and celebrated midsummer with some beer watched by some Guanacos. On the next day we hiked a circle of approximately 6 km the dwellings and well of the devil - Crater Morada del Diablo and Pozos del Diablo. The landscape is a rough beauty adorned with many different animals. On the next day we returned to the Torres del Paine and drove to the Guarderia Lago Grey, where we could stay the night without any costs. The rangers were very friendly, even WiFi was possible on request. Tommy took the boat to the Refugio Grey on the other side side of lake to hike the W, which is part of the Circuito Grande, which we had done last November. We climbed up 2 hours to the Mirador Ferrier, where we had some trouble to withstand the strong wind. Christmas Eve 2011 we hiked 6 hours to the Zapata camp and spent the night there totally alone. Our delicious Christmas dinner started with peanuts followed by cheese and ham sandwiches and finally pinacolada cookies. And we had some red wine, what a luxury! The environment of the Campamento Zapato is pristine, wild, rough and marvelous. It was close to sunset when we returned to car on Christmas Day 2011. Two firemen were checking this area. They gave us a flyer about the danger of fire and they admonished us not make any open fire. 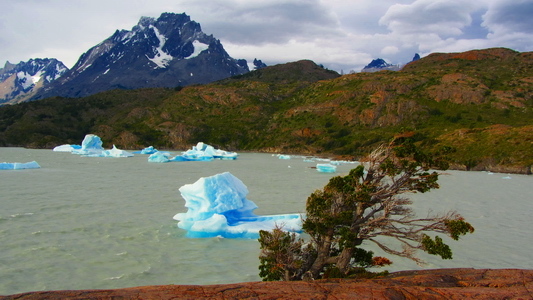 It is strictly forbidden in the Torres del Paine National Park. At the moment there is the most critical level red, because the last weeks were very dry and hot. And it is windy. We realized the importance of their job few days later, when we were in Argentina hiking to the base camps of Cerro Torre and Fitz Roy. There were unusually many people because the Torres del Paine National park was closed. A hiker burnt toilet paper and kindled an enormous fire on the other side of Lago Grey. Most of its woods and facilities were totally destroyed. Indeed we and Tommy were very lucky, because this incident happened two days after we had left the Torres del Paine! When we awoke in the next morning somebody visited us which is very shy and holes up mainly in the dense forest. St. Stephen's Day 2011 was beautiful with no clouds on the sky. We traveled to the Hosteria Las Torres, the eastern end of the W, to pick up Tommy. The side road to the Hosteria Las Torres is relatively steep and rough. There were some younger Chilean men walking along it. Somebody stopped us and asked us if we can give him a lift. Of course we did. Finally 8 men including their big backpacks were in our car. It did the way to the Hosteria slowly, very slowly but it did it! Tommy was waiting already there. We returned to the Guarderia Laguna Amarga to spend the night there. A rangers had told us that there are some Pumas South of it. Marion was very eager to see one; thus she and Alfred hiked at dawn a little bit up. Pumas are active in the night, so the best chance to see one is at dawn. We saw a lot of Guanaco herds and we were impressed about their safety strategy. The male and leading Guanacos watched the environment from elevations. If they detected something suspicious they shouted a grumping like warning. Immediately the Guanaco babies and kids were put between the adults. nein ich kann es kaum fassen, diese wunderschönen Bilder, hi sind die auch wirklich echt ?